Heart rate and sports monitors appear just about everywhere--in standalone devices, in watches, in bras, in shoes, in GPS devices--so why not just build them right into shirts. Many heart rate monitors need to be strapped to the chest anyway, so a heart-rate shirt seems like a logical conclusion. Under Armour is using that logic in its new E39 shirt. An unassuming, sleeveless compression base layer by day, the shirt moonlights as a hard-working performance monitor. Actually the monitor is a separate device, known colloquially as "the bug". Originally designed for tactical use by Zephyr Technologies, the sensor sits inside the sternum area of the shirt and measure all kinds of indicators including heart rate, breathing rate, temperature and three-directional movements. When you're done exercising, plug the sensor into your laptop, iPad or mobile phone and you'll get a read-out of your workout. Compare it with your last workout; compete with friends and push yourself to do better next time. 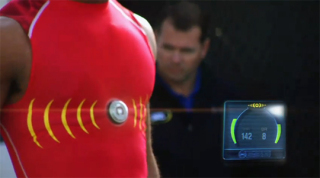 The shirt is being tested at the NFL Combine and should be available to us weekend warriors by next year. EDITOR'S UPDATE: The heart rate monitor shirt is currently unavailable. This chest heart rate monitor is a well-rated option as are many heart rate monitor watches. Not really buying into it. Sounds to me like something to put up against the Nike sensor. I have seen how the Nike sensor works with the athlete and the computer. This E39 seems somewhat lame. I listened to the segment discussing the process and I heard about the Special Forces, miners, athletes pushing themselves to another level but an athlete does not need E39 to already do that. Money spent in a wrong direction. Does Kevin Plank really think this is going to set Under Armour on a national stage. To the staff working on this project, I am sorry but in the next couple of years, you will be forgotten along with your work. So what is it that UA can team up with technology? Athletes primary concerns are sleep, nutrition, muscle building/recovery. Some what of Gatorade's campaign/direction went towards. I don't know, but I hope a lot of UA's money is not being put into this. To be honest, UA's ArmourBite does interest me. I can buy into that. But no way in this century will I buy, along with the world, into the E39. Sorry. It does sound ingenious to me but it's not something very new. I am still waiting for some breakthrough technology that would help sports people get more muscle though some good training exercises. Now we have the anabolic steroids for sale and protein food but I am confident we can go even further based on new technologies.